What do readers see when they first look at your posts? Are they drawn in . . . or taken aback? I have been blogging for a little over a year here on LinkedIn, and many readers know that my main focus is teaching American grammar. I do this to help the writers who follow this system look and sound as smart as they are. Lately, however, I’ve seen a few posts that are well written, but their “image” is just awful. Occasionally before I even read a post, I get caught up in the look of it, which throws me off and sometimes turns me off as well. I’m talking about formatting here — using the space and the few tools we have on LI intelligently and professionally, so that we draw readers in rather than repel them. While there aren’t many ways LI lets us personalize our posts, there are a few ideas that are important for all of us to consider. 1. First of all, please use the default font size that we’re given for most of the post — not this one! If you use h1 or h2 or the quote mark at the top to highlight something, that’s fine. But to write in all HUGE letters (as I have done here in h1) makes me — and perhaps others — recoil. It’s another version of shouting, and it hurts your professional image. Ah, this version is better, isn’t it? 1. First of all, please use the font that we’re given for most of the post. If you use h1 or h2 or the quote mark at the top to highlight something, that’s fine. But to write in all HUGE letters makes me — and perhaps others — recoil. It’s another version of shouting, and it hurts your professional image. 2. Put a space between each paragraph, so your ideas stand out clearly. Writing line after line after line without a break makes it really hard for us to read! No paragraph should ever be longer than about eight lines. Yes, I’m serious. You may have grown up hearing that if you don’t have a new thought you can’t create a new paragraph. Trust me on this: that doesn’t work in business writing. Give your readers the benefit of white space, so they can take in your thoughts clearly. White space is very reassuring to most readers. It says the reader won’t have to work too hard to read our post. FYI: Normally, with regular document programs like Word, we double-space between paragraphs, but here on LI one hit on the enter key will do the same job. 3. Keep your sentences short, especially if you don’t quite know how to use commas, colons, and/or semicolons well. I’m not saying you should write only five-word sentences; that would make you look as though you’d never left second grade! But writing a sentence that is more than about 20 words, even if it’s punctuated correctly, makes many readers work too hard. 4. Save the centered text for those few quotes you want to stand out. Otherwise, be sure to use the default left-side margins, so your post looks like stuff we’d find in most books. 5. Indent either five spaces on the first line, or leave it blocked to the left. Those are the two typical standards, and most readers won’t notice what you’ve done because it’s what they expect. I’ve seen many writers who indent two or three spaces — sometimes changing it in each paragraph — and it always looks odd to me. Now, if that’s the norm for YOUR grammar/writing system, then ignore this #5. But if you’ve never been sure how to do it, you might use one of my suggestions. My main point here is to help all of us remember we’re writing to inform others of something. When our style gets in the way, our message may get lost or muddied. I would love to hear your thoughts on this; you may have a wonderful idea or two for formatting that will help everyone in our networks continue to look professional in our posts. 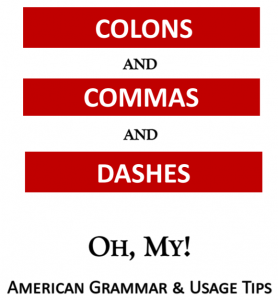 ← Pity the Poor Semicolon!